﻿ Fun Easy English - Travel the United States of America - Alaska. Learn before you travel. This section of Fun Easy English focuses on facts and other cool stuff about your favorite U.S. state. This is great English reading practice. This page focuses on the state of Alaska. 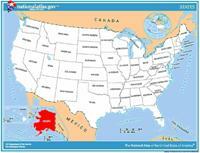 The nickname of the 49th state, Alaska, is the "Last Frontier." Purchased from Russia for $7 million in 1867, Alaska is the largest state in area and is the largest peninsula in the Western Hemisphere. Mt. McKinley in the Alaska Range is North America's highest peak at 20,320 feet and one of the greatest challenges for mountain climbers. 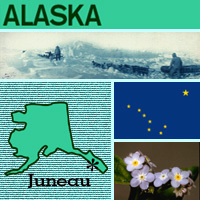 Juneau is the state's capital, and the state flower is the pale-blue forget-me-not. Alaska's state flag features The Big Dipper ("Ursa Major" or "Great Bear" constellation) as a symbol of strength, and Polaris (the North Star ) as a symbol of Alaska's northern location and "the ever constant star for the mariner, the explorer, hunter, trapper, prospector, woodsman, and the surveyor..." (quote from legislation). The blue background represents the sky, sea, lakes, and wildflowers of Alaska (the official state flower is also blue). The Alaska state flag (selected for its simplicity, originality, and symbolism) was created by Benny Benson, a 13-year-old 7th grader from an orphanage in Seward, Alaska (John Bell Bensona; 1913-1972). Seward honors him with a monument on 3rd Avenue. Alaska's state song is titled "Alaska's Flag." Notes: The North star is also found on the state flag of Maine. The Big Dipper constellation also contains "The Delaware Diamond" (state star of Delaware). Origin of Name Russian version of Aleutian word "Alakshak" meaning "great lands" or "peninsula." Travel and tourism site for Alaska - This state travel and territorial tourism site provides ideas for your vacations, meetings, and more. Have you traveled on any memorable highways in the U.S.? You would surely remember the Alcan Highway. Following chilly festivities held the day before with a temperature of 35 degrees below zero, the Alaska-Canadian (Alcan) Highway opened for its first full day of traffic on November 21, 1942. This important overland military supply route, a 1,522-mile roadway through the wilderness, connected Dawson Creek, British Columbia, with Fairbanks, Alaska. The threat of Japanese invasion through Alaska made the road a World War II priority. Over the Alcan Highway, the military could transport troops, food, and supplies to strategic points in Alaska. How long do you think it took to construct? When the Japanese invaded the nearby Aleutian Islands, completing the highway became even more urgent. More than 10,000 U.S. troops worked in cooperation with Canadian troops and independent contractors to accomplish this remarkable engineering feat in just over eight months! Among those soldiers building the Alcan Highway were four units of the Army's Black Corps of Engineers. All troops worked under extreme conditions. Mosquitoes and flies swarmed them in the summer heat, and temperatures near 40 degrees below zero chilled them to the bone in winter for weeks on end. To build the Sikanni Chief River Bridge, men waded chest deep into freezing waters to place the trestles. To keep themselves going, some of the men sang. Some African American soldiers, mainly from the South, sang old work chants like this "Steel-Driving Song." In addition to military personnel, about 2,000 civilians worked to construct the Alcan Highway. One advertisement stated, "THIS IS NO PICNIC! Working and living conditions on this job are as difficult as those encountered on any construction job ever done in the United States or foreign territory. . . ." But workers signed on anyway. Known by the men who built it as "The Road," the Alcan Highway is still Alaska's main link to the "lower 48" states. It is considered quite a challenge to drive, but a magnificent journey. If you traveled it, you might agree with an 1888 travel guide to Alaska, which stated, "Our trip to Wonderland will remain to the end of our lives a bright chapter in our experience." Have you ever been on a boat? Can you imagine living on one? In 1946 Marilyn Frink Jordan George left her home in the Iowa farm country to marry a U.S. Navy veteran who became a fisherman in southeast Alaska. She and her husband lived on a fishing boat and raised four children. Marilyn Jordan George was a writer, and her decision to move to the Alaskan wilderness provided a lot of material for her to write about. She wrote a book about their lives called Following the Alaskan Dream: My Salmon Trolling Adventures in the Last Frontier. She described the drastic change in her life -- going from a corn-fed Midwestern upbringing to the rough challenges of frontier living on a boat. Imagine how different the wide-open spaces of Iowa are from the confining space of a boat. During their early years, the four George children always wore life preservers. While Mrs. George looked after the children, her husband trolled (a kind of fishing) the coast of Alaska for salmon. In addition to writing the book about her family life, Mrs. George had a successful journalism career writing articles for many Alaska magazines. Because there are so many different kinds of fish and marine life, there are many different vessels and nets to catch them with. "Pots" are used to catch crabs, nets are used to catch salmon, and "trawlers" (boats with nets that drag the bottom of the sea) are used to catch shrimp. Vessels used in fishing include "seiners," (such as canoes from which nets are pulled in by hand and transferred to larger boats with powerful net-handling equipment), and "gill-netters," which range in size and often have sails to keep them moving with the wind. The following is a description of national forests, parks, and monuments in the state of Alaska. If you plan to visit or live in Alaska for awhile then you should definitely plan to visit some of these fantastic places. As the third largest National Forest, Chugach covers three unique landscapes: the Copper River Delta, Eastern Kenai Peninsula, and Prince William Sound. Many of the streams contain salmon and trout, and glaciers still carve the land here. Over half of the forest is tundra and glaciers. The largest National Forest, Tongass spans 500 mi (800 km) in southeast Alaska from the Canada–US border to the Pacific Ocean. Nearly one-third of the forest is covered by 19 wilderness areas. 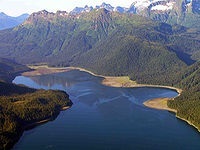 The forest includes Misty Fiords and Admiralty Island National Monuments. 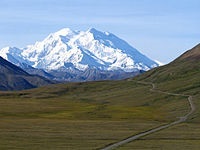 Centered on Denali, the tallest mountain in North America, Denali is serviced by a single road leading to Wonder Lake. Denali and other peaks of the Alaska Range are covered with long glaciers and boreal forest. Wildlife includes grizzly bears, Dall sheep, caribou, and gray wolves. The country's northernmost park protects an expanse of pure wilderness in Alaska's Brooks Range and has no park facilities. The land is home to Alaska Natives who have relied on the land and caribou for 11,000 years. 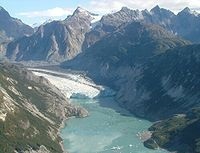 Glacier Bay contains tidewater glaciers, mountains, fjords, and a temperate rainforest, and is home to large populations of grizzly bears, mountain goats, whales, seals, and eagles. When discovered in 1794 by George Vancouver, the entire bay was covered by ice, but the glaciers have since receded more than 65 miles (105 km). This park on the Alaska Peninsula protects the Valley of Ten Thousand Smokes, an ash flow formed by the 1912 eruption of Novarupta, as well as Mount Katmai. Over 2,000 grizzly bears come here each year to catch spawning salmon. Other wildlife includes caribou, wolves, moose, and wolverines. Near Seward on the Kenai Peninsula, this park protects the Harding Icefield and at least 38 glaciers and fjords stemming from it. The only area accessible to the public by road is Exit Glacier; the rest must be viewed or reached from boat tours. Kobuk Valley protects 61 miles (98 km) of the Kobuk River and three regions of sand dunes. Created by glaciers, the Great Kobuk, Little Kobuk, and Hunt River Sand Dunes can reach 100 feet (30 m) high and 100 °F (38 °C), and they are the largest dunes in the Arctic. Twice a year, half a million caribou migrate through the dunes and across river bluffs that expose well-preserved ice age fossils. The region around Lake Clark features four active volcanoes, including Mount Redoubt, as well as an abundance of rivers, glaciers, and waterfalls. Temperate rainforests, a tundra plateau, and three mountain ranges complete the landscape. An over 8 million acres (32,375 km2) plot of mountainous country—the largest national park in the system—protects the convergence of the Alaska, Chugach, and Wrangell-Saint Elias Ranges, which include many of the continent's tallest mountains and volcanoes, including the 18,008-foot Mount Saint Elias. 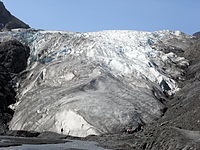 More than a quarter of the park is covered with glaciers, including the tidewater Hubbard Glacier, piedmont Malaspina Glacier, and valley Nabesna Glacier. Occupying most of Admiralty Island, the 7th largest in the United States, this monument is part of Tongass National Forest in Southeast Alaska. The monument protects the densest known population of brown bear on Earth, along with habitat for the Sitka black-tailed deer. Most of the monument has been designated as the Kootznoowoo Wilderness, restricting future development. The Greens Creek mine lies within the monument. Mount Aniakchak, which erupted 3,500 years ago, and the surrounding region make up one of the least visited NPS sites. Surprise Lake, within the volcano's 6-mile (9.7 km) wide, 2,500-foot (760 m) deep caldera, is the source of the Aniakchak River. Co-located with the NHLD Cape Krusenstern Archeological District, this coastal plain contains large lagoons and rolling hills of limestone. The bluffs record thousands of years of change in the shorelines of the Chukchi Sea, as well as evidence of some 9,000 years of human habitation. Valor in the Pacific encompasses nine sites in three states associated with World War II: The Attack on Pearl Harbor, including the USS Arizona, Utah, and Oklahoma memorials in Hawaii; the Aleutian Islands Campaign on Attu Island, Kiska Island, and Atka Island in Alaska; and the Japanese American internment at Tule Lake War Relocation Center in California. 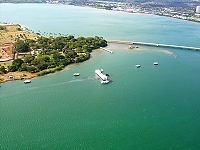 This national monument is also partially located in the state of Hawaii and California. This video is all about Denali National Park. This video is all about Gates of the Arctics National Park. This video is all about Glacier Bay National Park. This video is all about Lake Clark National Park.